As the speed of life and the number of our daily tasks increases, we search for ways to organize the chaos of our everyday duties. We try to automate as many things as possible to save up some time, or we delegate tasks to others in order to be able to take care of other important things. Microsoft Outlook, OWA and Office 365 have some useful options that help us manage our timetable in a more efficient way. The calendar, reminders and recurrence editor are certainly among them. But what about Out of Office messages? Is there a way to manage these items centrally so that users don’t have to think about setting auto replies every time they leave the office? Can we set recurring Out of Office messages centrally on Exchange or Office 365, without doing anything on the client machines and bothering our busy employees? The answer is yes, as long as we have CodeTwo Out of Office manager onboard. 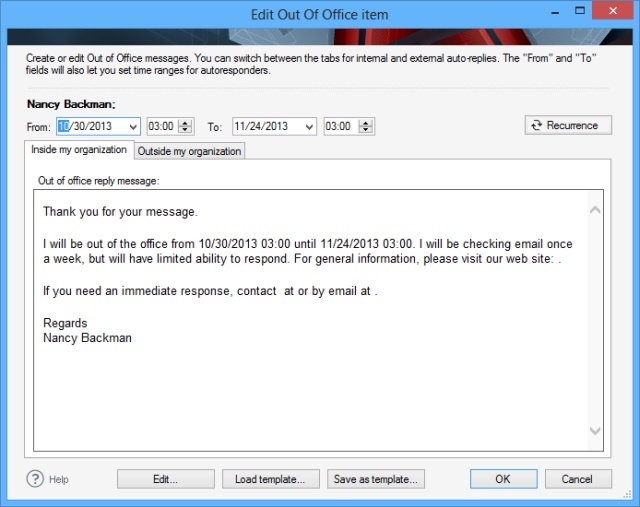 CodeTwo Out of Office Manager allows for central management of Out of Office replies in Exchange Server and Office 365. Thanks to this smart tool, an IT administrator or any other assigned person, e.g. a HR manager or secretary, is able to set Out of Office messages for employees without logging in to their mailboxes. What’s more, because of the simple graphical user’s interface the program is very easy to use and even a person with very little IT skills is able to manage it. The program lets you create, view and edit Out of Office messages of all users on Exchange Server and Office 365. It means that even when someone has some auto-replies already set, you are free to delete or edit them using the program’s GUI. This is especially useful when someone has left the office unexpectedly and forgot to set the auto-responder, or made a mistake in it while being in a hurry. Thanks to CodeTwo Out of Office Manager the IT administrator, or HR officer can set the Out of Office reply for this person with just a few clicks remotely. Just a few days ago a new update to the program, containing some new important features, has been released. 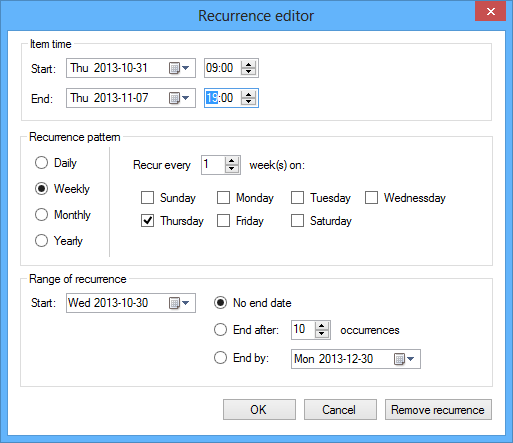 The most important novelty is the new Recurrence editor that enables setting recurring Out of Office messages in situations when users are out of office on the same days or hours during the workweek. The Recurrence feature in the program mimics the one in Outlook or Office 365. However, CodeTwo Out of Office Manager enables you to remotely set recurring auto-replies for any user, from the IT administrator’s, or any other designated person’s desk. This feature can come in handy e.g. when users work outside their office on certain, fixed days during the workweek. Setting recurring Out of Office replies for them saves you time and eliminates the risk that someone forgets about turning the auto-reply on when leaving the office. 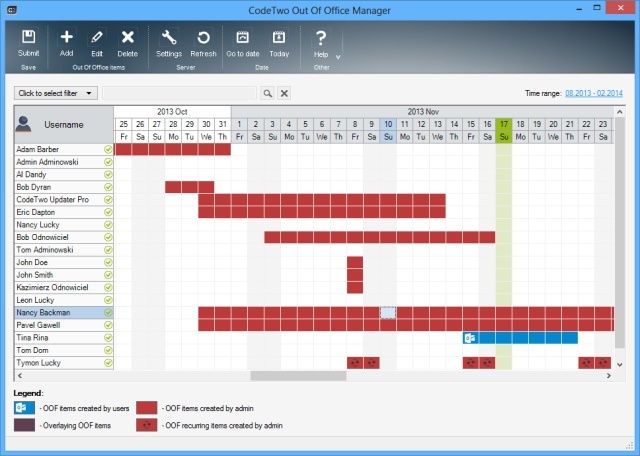 CodeTwo Out of Office Manger 1.1.0 is from now on available for download on the CodeTwo website. If you would like to test it in your environment, simply download the installer and use it for free for 30-days.